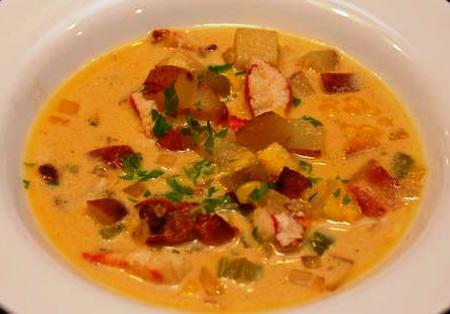 Here in New England the landscape is dusted with snow and it’s a perfect time to warm up with a pot of lobster stew. So, add a log to the fireplace, pour a glass of wine and tie on your apron! Boil diced red potatoes until they can just be pierced with a fork. Remove from heat and drain. In a Dutch oven or stock pot, combine all ingredients, including cooked potatoes, and bring to boil. Season with salt and pepper to taste. Add cornstarch mixture and stir until stew is desired thickness. Serves 4.